Hey all and welcome to welcome! We’re a local and friendly running club that was founded in 1986 and have specialised in distances from 5K to the Marathon ever since. Our primary interest remains road running but we also enjoy trail running, the occasional multi-terrain event and of course Cross-Country. But don’t be frightened off by this, we’re mainly made up of a large group of very relaxed runners, who like to socialise as much as we train, after our Wednesday night sessions we like to meet and chat over a drink, and also participate in a number of events. For more information, check out the beginner session or contact links above, we hope to see you soon! PS. 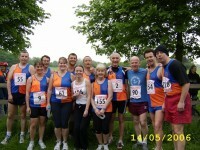 We are affiliated to UK Athletics, Middlesex County AAA and SEAA welcoming male and female runners from the age of 18. I am thinking of taking up running for fitness. Only problem is, I have bad knees and can only run on grass … How often do you go on cross country runs? Do you know of any other cross country running clubs? I am the event manager for the Greenwich and Victoria Park 10k runs for the BHF. We would like to invite your running group to come along to our runs in August this year and as a goodwill gesture, would like to offer you or some of your runners some free spaces on these events. If you are interested, please email me back and we can arrange the places for you. Hi, I am very interested in joining your running club. Hi, my wife and I are interested in joining your next beginners group at stockley pk. We are both complete beginners. Do we just turn up and what I the cost please. I am a regular runner that wants to look at joining up for a local running club. I regularly run 5k and 10k distances and enter events. Been running since March13 and entering events since October13. I live in West Drayton. What does the running group enter event wise? How many people in the running club? What days and distances do you train?